. Preheat the oven to 170ºC/325ºF/gas 3. Place a large casserole pan (30cm in diameter) on a high heat. Season the brisket well with salt and pepper and brown it in the hot pan with a lug of olive oil while you peel and slice the onions. Turn the heat off and place the onions underneath the brisket. Spread the fat side of the meat with the mustard and strip over most of the rosemary leaves. Protect the meat with a wet piece of greaseproof paper, then tightly cover the pan with a double layer of tin foil and cook for around 4 hours for carveable meat, or around 5 for pulled meat. Check it halfway and add a splash of water, if needed, sealing the foil back securely. 2. Meanwhile, peel the potatoes, halving any larger ones, and parboil in a large pan of boiling salted water for 12 minutes. Drain and shake to fluff up, then tip into a roasting tray with a lug of olive oil, a pinch of salt and pepper and the remaining rosemary leaves, and toss to coat. Place in the oven below the brisket for the final 1. hours. Peel and roughly chop the carrots and swede. Cook in a pan of boiling salted water for 20 minutes, or until soft, then drain. Return to the pan, mash with the butter, season to perfection and keep warm. 3. Remove the brisket and potatoes from the oven, transfer to a board and cover, then turn the oven to full whack (250ºC/495ºF/gas 8). Put the pan on a medium heat on the hob and stir in 2 tablespoons of flour. Stir in the jam, vinegar, 400ml of boiling water and any resting juices, then simmer until you’re happy with the consistency. Meanwhile, put a 12-hole shallow bun tin into the oven with a little vegetable oil in each compartment, to get hot. Put 100g of flour into a jug with a pinch of salt, whisk in the eggs, then gradually add the milk until you have a smooth batter. Remove the tin from the oven, then quickly and carefully fill each compartment three-quarters full with batter and return to the oven for 10 minutes, or until puffed up and golden. Carve up or pull apart half the brisket, saving half for leftovers. Serve everything in the middle of the table with seasonal greens, and all your usual trimmings. 4. Tip: If you’re not going to use all the leftover brisket within 2 or 3 days, simply portion it up and freeze for making meals in future weeks. Defrost in the fridge for 24 hours before cooking. 28 Feb	This entry was published on February 28, 2015 at 1:00 pm. It’s filed under RED MEAT and tagged Brisket recipe, Jamie Oliver recipe, Roast beff brisket, Sunday roast. Bookmark the permalink. Follow any comments here with the RSS feed for this post. Looks incredible. So fall apart tender. Good to see you Nargess jan! You came back with a bang! 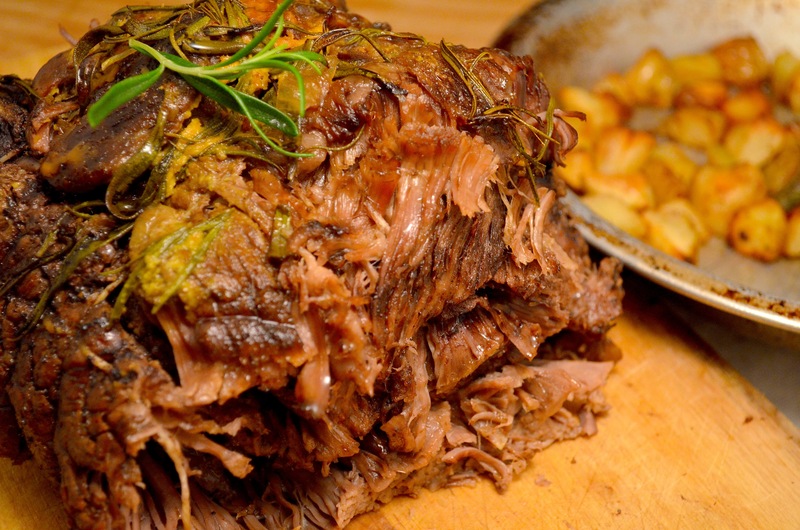 Exactly how a roast should be… fall apart with touch, and melt in the mouth! 🙂 You don’t have the muffins in the photo? I’m not a huge brisket fan, but yours looks wonderful! Good to know about this cookbook, too!